Amy Mebberson is a professional comic artist, book illustrator, designer and fine artist specializing in licensed and all-ages characters. Most of her work has been for the Walt Disney Company and its licensees, including Acme Archives, Hachette Book Group and various comic publishers. Amy is also a regular designer for Hasbro, working on various licensed toy lines. Amy started her career at Walt Disney Animation Australia as a trainee in-betweener and had moved up to Senior IB and unpaid Assistant Animator by the time the studio closed in 2006. 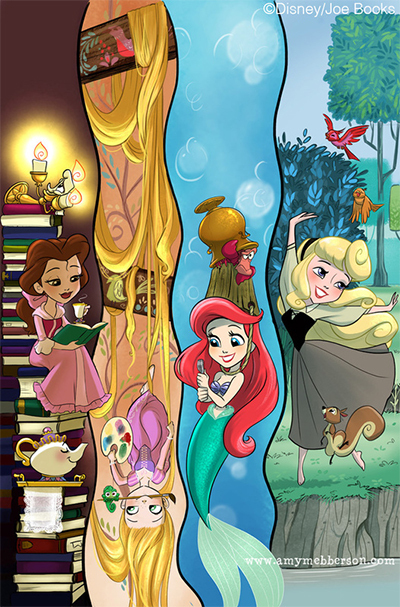 She then moved to the States and resumed her association with Disney with a series of comics published by Boom! Studios. Since then, Amy has produced art for The Muppets, My Little Pony, Sesame Street, Wonder Woman, and Strawberry Shortcake as well as her continued work for Disney.